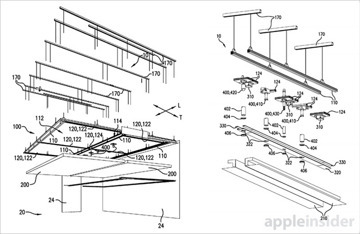 As part of efforts to revitalize an aging retail design language, Apple on Tuesday was granted a patent for ceiling lighting systems that are currently rolling out to so-called "next-generation" Apple Stores around the world. 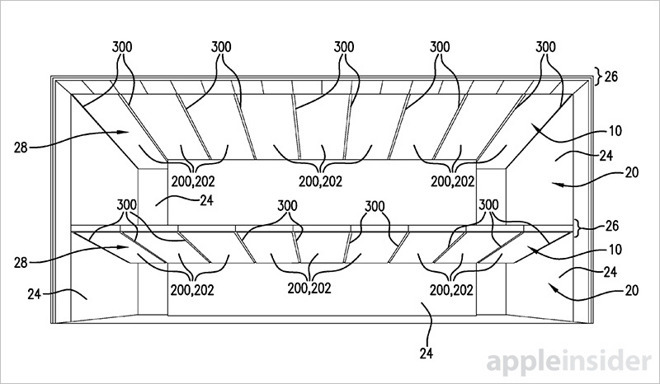 The U.S. Patent and Trademark Office granted Apple U.S. Patent No. 9,217,247 for a "Ceiling system" details an indoor lighting installation comprised of wall-to-wall lighted ceiling panels and linear light troughs. 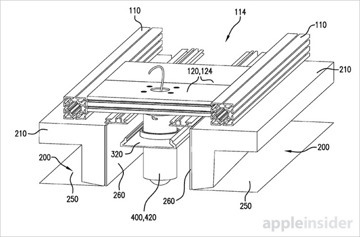 Renditions of the patent are already being used in new international builds, one of the first being Brussels, as well as recently renovated locations like Apple's Cupertino, Calif., campus outlet. Instead of single points of light or individual banks, Apple's design turns an entire ceiling into a huge diffused lighting apparatus. According to Apple, uniform lighting offers an ideal customer experience and offers flexible product display options for wide-open spaces, an Apple Store hallmark that is taking on new meaning under retail chief Angela Ahrendts. In various embodiments lighted or non-lighted ceiling panels extend from one wall to another, sectioned off at regular intervals by narrow inverted troughs. Lighted panels might contain LEDs or other light sources spaced out evenly, either directed down toward the show floor through a fabric or plastic diffuser, or up to a reflective backing. Troughs span the ceiling and incorporate LED subsystems that can be oriented to emit light horizontally toward a trough's centerline, or vertically as a downlight. Certain embodiments allow for a T-bar to extend downward, allowing space for air ducting. Thanks to the innovative design, cameras, speakers, alarms, fire suppression systems and other electrical systems can be mounted behind the proposed ceiling panels and within the longitudinal troughs, keeping them hidden from view. 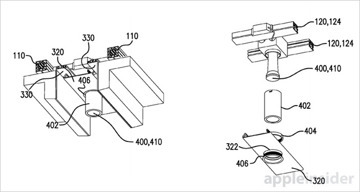 While not in the patent language, Apple can also build iBeacon hardware directly into the ceiling. Under the guidance of Ahrendts, with the help of CDO Jony Ive, Apple's brick-and-mortar retail chain is undergoing a major facelift. On Sunday, Ahrendts gave "60 Minutes" a sneak peek at a mockup Apple Store housed in a nondescript building near Apple's Cupertino headquarters, saying her goal is to provide customers a dynamic shopping experience when they visit one of the next-gen outlets. 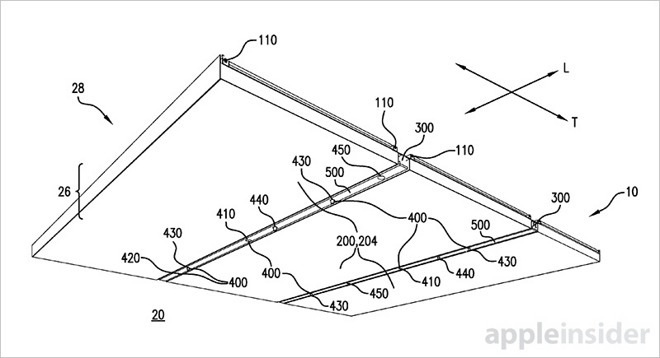 Apple's ceiling lighting system patent was first filed for in February 2014 and credits Stefan Behling, David Nelson, James McGrath, Wolfgang Muller, Lorenzo Poli, Bernd Richter, Robert Bridger, Jonathan P. Siegel, Vasco Agnoli and Casey Feeney as its inventors.